Aunty Ruth sends us into her Orchards to gather Apples, fill the boxes and bring them to her little Store by the Highway, where lots of people stop by. There are 4 different Apples to pick. Aunty Ruth wants some to sell for Eating, some for making Cider & Juice, some for Baking and some for Sauces. 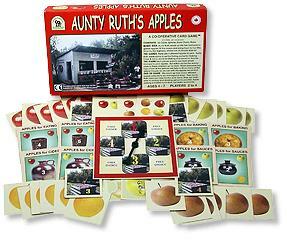 Each player spins to see from which Orchard to pick apples. But watch out for the wormy ones or those chewed up by deer! When everyone has had a turn at the spinner, we help to fill as many of the different boxes as we can with the apples we picked, and count up how many different boxed collections we managed to finish. Then Aunty Ruth pays our Crew for the work done. Thus, our math skills of adding and dividing get some practise. Apple picking is indeed hard work, but really worthwhile.